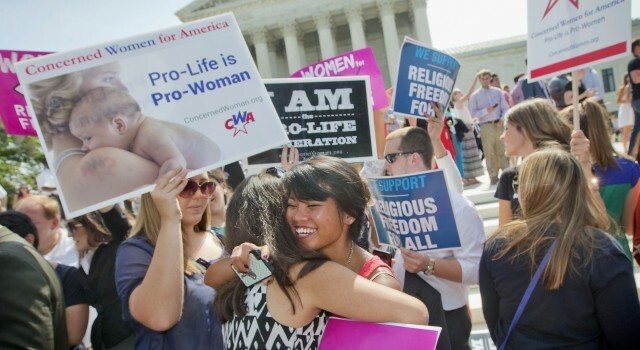 The Supreme Court today expanded the scope of religious-liberty rights and dealt a blow to part of the Obama administration’s health care overhaul when it ruled 5-4 that some for-profit businesses have religious rights and, as a result, can opt out of the law’s contraception mandate. But the ruling, while important, is limited because it applies only to smaller, closely held businesses and specifically warns against companies using religious-liberty claims to discriminate. The cases – Burwell v. Hobby Lobby Stores and Conestoga Wood Products v. Burwell– stem from regulations arising from the Affordable Care Act (also called Obamacare) that require many employers to include free coverage for contraceptive services in their employees’ health insurance plans. While the regulations entirely exempt churches and provide religiously affiliated nonprofits, such as hospitals and charities, with an alternative for ensuring that their employees are covered, they do not extend to for-profit employers. The owners of a number of these businesses sued the federal government, claiming that that the 1993 Religious Freedom Restoration Act entitles them to relief from the mandate based on their religious objections to some forms of contraception. RFRA directs courts to exempt any party who can show that the challenged law or government action substantially burdens his or her religious practice, unless the government shows that the law in question advances a compelling state interest and that such an interest cannot be advanced without burdening the person’s religious rights. In its decision, the high court agreed with Hobby Lobby and Conestoga, ruling that “closely held” corporations should be accorded religious-liberty rights and are covered by RFRA. The court said that although it was willing to concede, for the sake of argument, that the federal government has a compelling interest in providing women with free contraception, the government failed to prove that it can only advance this interest in a way that burdens companies’ religious-liberty rights. Indeed, the court said, the government could easily accommodate these and similar businesses and still provide these companies’ female employees with free contraception by simply extending to for-profit businesses the alternative it has offered to religiously affiliated nonprofit employers such as religious hospitals, schools and charities. This alternative allows employers to opt out of contraception coverage and requires health insurers in these cases to offer female employees free contraception through a separate policy. While the court handed advocates for religious accommodation a major victory, it also took pains to draw some lines around the decision. First, the majority limited the ruling to closelyheld companies in which a small group of individuals not only own the entity but are deeply involved in its governance and operation. The justices specifically stated that the decision does not apply to publicly held corporations. In addition, the majority made clear that this ruling does not give employers license to discriminate against racial and other minority groups in employment or in the provision of goods and services. The Hobby Lobby decision does not represent a radical change in religious-liberty law – even as it applies to for-profit businesses. The fact that the ruling is limited to closely held companies, and that the majority specifically warns against the future use of religious-liberty claims by businesses to justify discrimination, means that the decision could have a limited impact in future cases involving businesses and questions of religious rights. At the same time, it is unclear how this ruling could influence a series of other cases (that could reach the high court as early as next year) involving religiously affiliated nonprofits. These organizations are challenging the contraception mandate, even though the Obama administration crafted an alternative allowing them to opt out of directly providing free contraception. While the court recommended the use of this option in the case of for-profit companies, it did so without knowing whether Hobby Lobby would be satisfied using this alternative. Since the nonprofits contend that their religious liberty rights are burdened even with the opt-out alternative, today’s decision does not necessarily mean that the justices would find it sufficient for these nonprofits, even if Hobby Lobby and other businesses are amendable to using it. An April survey taken by the Kaiser Family Foundation found that a majority of Americans (55%) believed that for-profit businesses should provide free contraception to their employees, even if doing so violates the personal religious beliefs of a company’s owners. Among women, support for employer-provided birth control was slightly higher at 61%.